SunSystems (formerly Sun Accounts) is a market leading financial management solution with integrated financial management, purchasing, inventory and sales management tools. Trusted by over 9,000 organisations globally in 190 countries, SunSystems and the related Infor business management modules are mobile, globally enabled, collaborative and highly adaptable, to help you accelerate growth, while keeping costs and risks under control. Check out the features, benefits and modules of the SunSystems accounting system in more detail. SunSystems financial modules are specifically designed to provide immediate access to all finance information for fast and effective decision making. Modules include: Foundation and Accounting, Fixed Asset Management, Corporate Allocations, Advanced Inquiry, Consolidation (data aggregation). SunSystems business modules streamline sales order entry, manage customer information, pricing and invoicing within SunSystems. Modules include: Sales Invoicing (standard), Sales Invoicing (recurring), Contract Service Billing, Sales Order Processing, Purchase Invoice Register, Purchase Invoice Processing and Inventory Management. SunSystems enhancement modules are designed to prevent users having to re-key transactions that already exist in SunSystems. Infor SunSystems Cash Desk modules include: Banklinks for Business (B4B), eRemit, Collect (debtor management) and Bank Reconciliation. Infor Query & Analysis (Q&A) provides a unique insight into financial and operational performance by providing drill down analysis into multiple dimensions of your SunSystems data. Infor Dynamics Enterprise Performance Management (Infor d/EPM) is an integrated business intelligence software designed to help you improve operational insights in order to power better business decisions. Future-proof your business with Infor OS - the foundation for a connected, intelligent integration network that automates, anticipates, predicts and inform your stakeholders in everything they do. The Infor ION™ Integration Framework helps the flow of information between applications, analytics, social media and a powerful business vault. 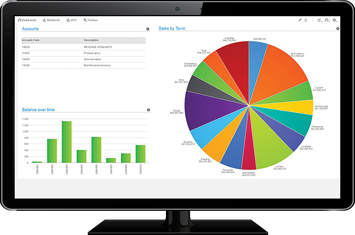 With Infor ION, businesses get common reporting and analysis, workflow and business monitoring with one, consistent architecture. Infor Ming.le™ is a comprehensive platform for social collaboration, which leverages the power of the ION Integration Framework to help unify business applications and their data into a single intuitive interface that is as easy to use as Facebook or Twitter. Infor CloudSuite Expense Management is a comprehensive solution for automating and managing the full range of employee-initiated spending. It includes a collection of distinct functional modules.